I recently compiled the stats for goals conceded from corners in the Premier League and it threw up some interesting results as you can see from the table below. 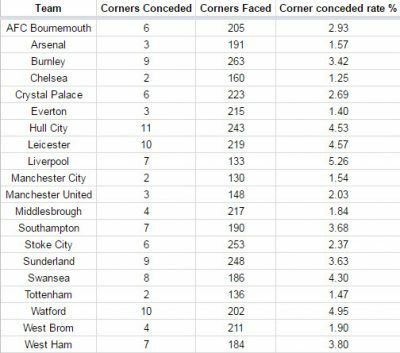 So Manchester City, Tottenham and Chelsea all conceded the least from corners, obviously, all 3 teams have faced fewer corners than most other teams, but the percentage of corners to goals is still remarkably low. Manchester City’s numbers stick out the most to me as they have the smallest side (in terms of height) in the Premier League by a significant amount – so how have the smallest side in the league got one of the best corner defensive records? I’ll be looking at 6 games, each game against the three sides that scored the most goals from corners which were West Brom, Chelsea and West Ham to work out how Man City set their team up to nullify the attacking threat posed. Numerous articles have been done on West Brom’s (including this excellent one and this one that I wrote) success from corners this season as they ended up with an outstanding 16 goals from them. West Brom are a physically intimidating side with many players over 6 foot tall yet Man City contained them perfectly in the limited amount of corners faced. Emphasis looks to be set on protecting the 6-yard box and goalkeeper, 2 areas in which West Brom normally try to seek an advantage. We can see John Stones (#24), Nicolas Otamendi (#30), Aleksander Kolarov (#11) and Fernando (#6) form a wall in front of Claudio Bravo with Fernandinho (#25) guarding the near post ready for the run that West Brom normally tries to look for. Raheem Sterling (#7), David Silva (#21) and Ilkay Gundogan (#8) try to form a second block whilst Kevin De Bruyne (#17) and Sergio Aguero (#10) sit further out ready for a counter-attack. A similar set-up was employed during the return encounter later on in the season with a slight ring just inside the 6-yard box, backed up by a secondary line just over the edge of the 6-yard box. Stones (#24) again takes up a central position along with Fernando (#6). Aguero (#10) is again the furthest player from the goal. Gabriel Jesus (#33) and De Bruyne (#17) sit just on the edge of the 6-yard box to track runners. It’s interesting to see so many players grouped in such a small space, but that essentially just turns the corner into a gamble on whose head will land on the ball first – but with City committing pretty much every player back to defend, the odds were in their favour. An interestingly set up corner. The main Chelsea threat of Diego Costa (#19), David Luiz (#30) and Gary Cahill (#24) all start rather deep and have 2 banks of players in front of them to contain their runs. Jesus Navas (#15) is put out to stop the short and along with Kolarov (#11) helps to contain the threat when Eden Hazard (#10) makes the darting run out to the corner taker. Again though the mass of defending City players massively outnumber the attacking Chelsea contingent and the corner is well defended. Another odd corner. Obviously realising the City defence cannot be penetrated by runners, Chelsea opt for the gamble and cram their attacking threat into the 6-yard box hopeful to get a Chelsea head on the ball before a City player, however still heavily outnumbered the odds are stacked against them and again City clear with relative ease. With only 5 players committed forward from Chelsea, Man City weren’t willing to take any risks and had a majority of the team back to defend. Again we see that familiar line on the edge of the 6-yard box with Stones (#24) and Kompany (#4) being the rocks in the middle, flanked by Fernandinho (#25) and Fabian Delph (#18) with Gael Clichy (#22) hovering close to the 6-yard box. Chelsea try to drag a player out of the box by offering up the short corner so Jesus Navas (#15) comes across to cover. Interestingly this is almost a pure zonal marking setup, whereas previously it’s been a bit of mix (although still mostly zonal). A bit of an odd set-up this! The line on the 6-yard box consists of just Stones (#24), Kompany (#4) and oddly Sterling (#7), the positioning of Delph (#18) is pretty suspect as there’s pretty much no attacking threat near him with Fernandinho (#25) covering the run of Gary Cahill (Chelsea #24). Silva (#21) also offers very little in his defensive position. Interesting that Chelsea only committed 4 players into the box for the corner with City bringing back 8 to defend. With only 5 minutes left of the match and Chelsea winning 2-1 at the time, it’s easy to see why Chelsea only put 4 forward but it seems unnecessary to commit for City to commit that many back to defend when losing. One of Nolito (#9) or Navas (#15) could’ve been moved up the pitch, along with Aguero and potentially Silva to pose a counter-attacking threat. West Ham take the bold approach of committing 6 players forward for the corner. The trio of James Collins (#19), Cheikhou Kouyate (#8) and Angelo Ogbonna (#21) all make runs from deep whilst the other trio of attacking West Ham players attempt to occupy and distract the main defensive line on the 6-yard box. Once again though the City ranks hold firm and show that when done right, zonal marking at set-pieces can work fantastically well. Almost identical to the last corner in every single way! It’s definitely visible from these pictures what West Ham’s plan from corners was: Distract the 2 best headers of the ball (in this case Kolarov and Otamendi) then target the rest with runners attacking the ball from deep. Whilst I’d say that’s a good strategy against most zonal marking systems, the sheer amount of numbers in the box for City gives them a huge advantage with plenty of bodies in the way. After the previous plan failing West Ham try to attack with just runners. It didn’t work. Again the main centre-backs of Otamendi (#30) and Stones (#24) line up on the edge of the 6-yard area against a minimal threat from West Ham who – with just 8 minutes left on the clock are 4-0 down and only commit 4 men forward for the corner. That being said, City aren’t taking any chances and defend with the entire team behind the penalty spot. Simple spacing between players and the numbers for each team meant this was only ever going to end in City winning the ball. Similar to the above. Stones, Otamendi and Kolarov again form their wall on the 6-yard box and sheer power of numbers wins out.